Several users have reported having issues with iTunes after having updated their system to El Capitan so far. If you have had any issues with iTunes recently and you have updated your Mac system, you aren’t alone. While errors happen from time to time, you might still be confused as to what to do now, especially if it happens each time you go to use iTunes. Not to worry, this article will help guide you through some of the solutions to fix the problem. In some cases, all your program needs is a simple restart. This is the easiest solution to try out, so you should do this first. Simple select “Restart…” from you Apple menu. Once your Mac has restarted, try launching iTunes again. Another simple thing to check is what version of iTunes you have installed. Sometimes not having the most recent version can cause these bugs to happen. Next, try turning your Wi-Fi off and then launching iTunes. 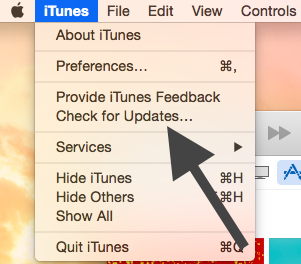 After iTunes has loaded, then go to the menu, select “Store” and then “Sign Out” from the drop-down menu. After you have signed off, quit iTunes. Turn your Wi-Fi back on and then try launching it again. Sometimes a third-party script or plug-in of some kind can cause these types of problems to occur. You can test out this idea that it is a third party by launching iTunes in Safe Mode. Hold the Option and Command keys down while iTunes is being launched. This will start the application in Safe Mode; you can be sure when you see a pop-up message that looks like the image above this list. Once you see this message, click on “Continue”. If iTunes works the way it should while in this mode, it is in fact the result of a third-party application or add-on that is causing your iTunes to not work otherwise. You can see iTunes add-ons in the folder ~/Library/iTunes/iTunes Plug-ins/. In order to figure out which add-on is causing the issue, close out of iTunes and move each add-on individually onto your desktop. You might even want to check the manufacturer’s page to see if you can install any updates for the add-on. Launch the Terminal app, which you can find in the Utilities or Applications folders. The point of doing it this way is that it instantly removes it from your Mac. Reinstall iTunes from its download page and follow its instructions from there. Even with the 5 ways I listed within this article, it is possible the iTunes issues are just due to your computer’s age. Hopefully your iTunes works by now so you can enjoy all your music and media once again! If you experience any other issues, always check to see if your fellow users are too so you can find a solution together. How to Fix Your Mac When It Is Stuck on “Setting Up Your Mac”?